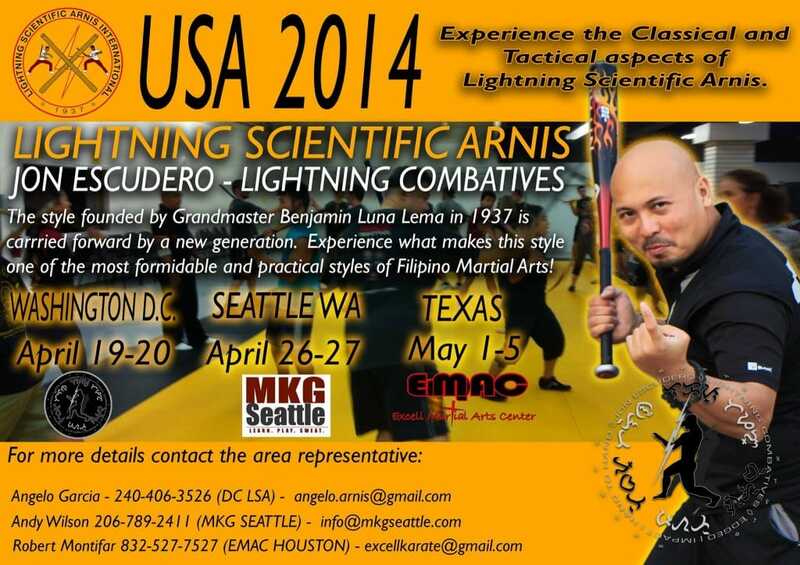 Master Jon Escudero is back in Seattle this April 26th and 27th for another seminar weekend on Lightning Scientific Arnis. This seminar is open to students of all levels. Lightning Scientific Arnis is a Filipino Martial Art (FMA) from the Island of Panay founded by the late Grandmaster Benjamin Luna Lema in 1937. It was a synthesis of the different techniques informally practiced throughout the Island and incorporates the techniques of Tercia, Serrada, Cadenilla and espada y daga with the use of: single stick, double stick, stick/sword and dagger, -s line of sight (Serrada) and focuses on the power generation and speed of the weapon. Master Jon Escudero will be coming over the US this spring 2014, to conduct Seminars in Seattle, Washington, D.C. and Housto. The seminar will be of Lightning Scientific Arnis fighting concepts in bolo work, baston serrada, knife and hand to hand applications. More infor about Master Jon Escudero and LSAI can be found here: more information to follow.